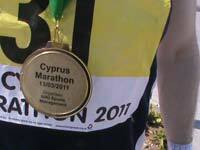 We were delighted to be invited to visit Pafos for the Cyprus Marathon, Half Marathon, 10K and 5K by the race organisers. This historic, cultural and beautiful Mediterranean island offers the perfect weekend get away and chance for some winter sun. After years as a British colony English is widely spoken and they drive on the left! Even better there is the choice of 3 distances. 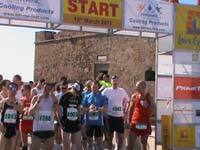 The full Marathon starting at the birthplace of Aphrodite, the Greek Goddess of love and beauty - the Half Marathon and the 10K, both starting and finishing in Pafos itself. This makes it a perfect venue for Running Clubs and Groups where everyone gets to choose the distance that suits them. We know that you are going to love the package that we have put together here. 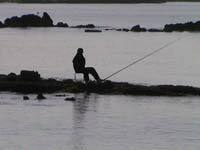 There is such a lot to see and do in the Pafos area. All courses are gently undulating and run on the quiet roads (not traffic free). Well marshalled and assisted by the Cyprus Police. 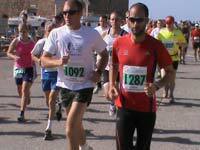 Marathon - The Marathon course is a point-to-point course starting at 0830am along the coast at the magical and scenic Aphrodite's rock - birthplace of the Greek Goddess of love and beauty - and perhaps best known symbol of the island. The Marathon field will be relatively small and with the likelihood of some warm weather it is suggested that this is an event for dedicated Marathoners. The course is undulating as it winds itself back along the breath-taking, stunningly beautiful coastline of the South of the island. Time limit 5 Hours. 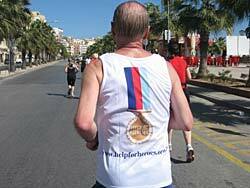 Half Marathon - Starting and Finishing in Pafos itself by the historic fort. Again gently undulating - an out and back course. Time limit 3 hours. 10K - Another out and back course starting 15 minutes after the Half. Time limit 90 Minutes. You may like the idea of running in Limassol just a week later and we will be pleased to let you have details of our double-header package (All accommodation, transfers, transport and race entries included) - just write Paphos/Limassol combined trip in your application. 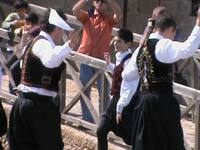 There is so much to see and do in Pafos. The entire town is a UNESCO World Heritage Site. 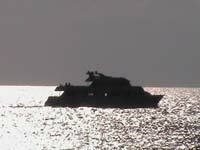 The charm of the Greek Olympic Goddess of love and beauty Aphrodite can be felt throughout the area. 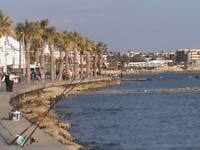 Whilst Pafos is now a relatively busy tourist town, it has still maintained it's small fishing harbour and its traditional activities. For the race, particularly the Marathon, we suggest taking a seat at a harbour-front café and watching events unfold. The Half Marathon and 10K runners will pass twice before the arrival of the Marathoners. There are many tourist hotels in the Pafos region and with good weather throughout the winter, most stay open all year round. However there are only one or two that are well placed for the race as well as the rest of your time here. We have secured accommodation at a great 3 star hotel on a half board basis. It is the closest to the Start/Finish area at just 800 metres (5 minutes walk) and so is ideal for kit security, changing, showers and that all important last toilet visit!  average monthly rainfall: 2.1"
As well as being of huge historical and cultural interest, Pafos is also a well known tourist resort. There are numerous cafes, bars, pubs and restaurants all within walking distance of the hotel. Fortunately though out of earshot! We know all the best value places to eat, drink and party. Our pasta meal at a trustworthy good value restaurant the night before the race is always popular and a great social occasion. Our after race party complete with prizes and surprises is always worth staying up for. There is ample to do for the nightowls! This weekend offers a great opportunity for Clubs or Training Partners to get together. It may also make the travel arrangements more convenient and enjoyable. There are discounts available for larger groups (20+), but even a group of just 10 will qualify for an additional prize for the first or last to finish (you choose). If you are interested in taking part in this event, simply complete and send the application form . Further information including prices and travel tips will be sent by return.